Posted on June 14, 2017 June 9, 2018 by NGCHS, INC. In the late 1880’s, August Pieper staked claims on the land from south McLane Road east beyond what would eventually become State Highway 87. More than half a century later, the sons of Frank Owens eyed it as a perfect place for their sawmill. In 1951 the Owens family located their sawmill in the old Pieper Meadow. The meadow was an open area leading down from Main Street to the American Gulch. In the dim past, Tonto Apache women planted and harvested corn there near the spring-fed stream. In 1884 the excited yells of cowboys roping calves rose from there as Charlie Meadows and his cohorts held the first rodeo in Payson. 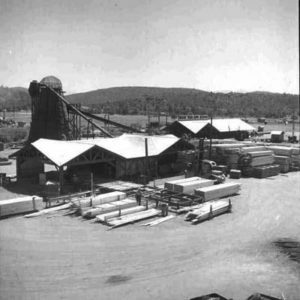 The Owens Brothers were not the first to operate a sawmill in Payson. That honor went to early settlers William Burch and John McDonald who set up a mill where the Baptist Church on Main Street would later stand. Sarah McDonald Lockwood’s grandfather brought his mill down from Pine and purchased some of the Pieper property for it. That sawmill was bought by the Chilsons, and several years later taken back to Pine, closer to logging operations. The sons were enterprising even as youths. Kerm made his own wooden toys and collected whiskey bottles during the Depression to sell to bootleggers. Likewise, he collected empty medicine bottles and sold them to Dr. Risser. In Payson, the family lived in the house that Dr. Risser built at Oak and Main Street. The boys set up a small sawmill the their back yard. They cut wood for the stoves of local families, and cleaned buildings in their high school years to earn money. After high school, Kerm worked for the CCC and built cabins for the Boy Scout camp. His various jobs included working in the Zulu Mine near Payson, until he and his brother Keith decided to go into the sawmill business. In 1935 they set up a portable mill in the forest near Diamond Point, close to their source of supply. That same year they provided the lumber for Payson’s first church building on Main Street. After a year, Kerm, who was very creative at inventing machines and making models, decided he wanted to become an architect. He left the mill and took drafting classes at the college in Tempe. When family finances would not permit him to continue, he returned to the sawmill. During World War II Kerm left Payson again to work for an architectural firm in Phoenix that was holding government contracts. After the war he took up the sawmill business once again, joining Keith at the Diamond Point site. In 1951 an event occurred that changed the brothers’ lives and resulted in a great benefit for the town of Payson. The sawmill in the forest burned. In those days the wasted sawdust and chips were burned in open burners, and sawmills often caught fire. 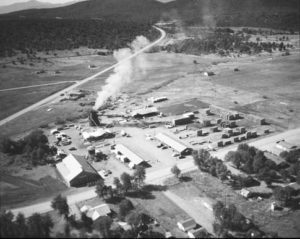 At this juncture the brothers took a leap of faith and purchased the meadow property from the Hathaway family, moving their sawmill operation to Payson. Incorporating modern power equipment, they built a new mill and were under way with the business the very next year in 1952. Kerm soon found restlessness getting the better of him, and sold his share to Keith. At Keith’s urging Kerm remained to manage the business and invented various contraptions and tractors to handle the logs. His handcrafted, working model of a sawmill is on display at the Rim Country Museum in Payson. 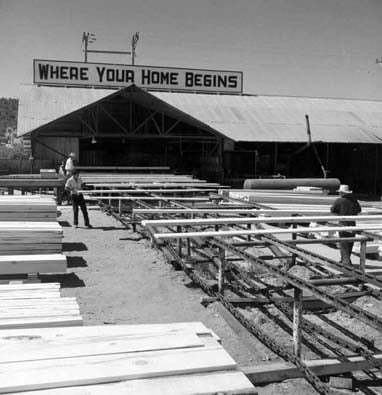 The Owens Brothers’ sawmill became the area’s foremost employer, and a major benefit for the Tonto Apache Tribe. The mill was soon employing from 40 to 60 persons and providing 3 to 5 million board feet of lumber to the Arizona market each year. Chief Campbell recalled how the lumber mill drew other Apaches to Payson seeking work. “The San Carlos and Verde Reservations didn’t give them that employment. Oh, they’ve got sawmills, but they are much different than this. What I mean is, if you miss a day and you’ve got a family to support they’re going to lay you off for a week just because you missed one day. Now up here, you can miss 2 days and still go back to work the third day…” This was indicative of the community spirit of the Owens family. When Tonto families were having financial troubles, the mill and the local bankers would give loans and credit. Tragedy struck in 1957 when Keith Owens was electrocuted at the mill. His wife sold the operation to Kaibab Industries in 1958. Kerm continued on managing the operation until he retired in 1971. As the movement to save animal and forest habitat gained momentum, the logging industry faded as a viable local business. After over 40 years of service in Payson, Kaibab shut down its operation in the spring of 1993. Information about Kermeth’s early life comes from an interview with him in January 1986 by eighth grade student Jay Cee Pearce, during a class assignment in oral histories. In an interview with Mr. Houser in 1970.